Kenya is the largest per capita consumer of milk in Africa but the rural, small-scale nature of production makes it difficult to get milk to market. Milk hygiene, spoilage and loss are primary challenges in the sector. Introducing satellite coolers and offering training to farmers can be hugely profitable as they quickly reduce losses. We found that satellite coolers have an annual internal rate of return (IRR) of about 300% over five years. Moreover, given the high greenhouse gas emission intensity of milk production, a single cooler can reduce emissions by more than 1,000 tons of CO2 equivalent in its lifespan. This is equivalent to 426,000 liters of gasoline consumed. Maize, a staple crop for many African farmers, is highly rain-dependent in Tanzania. At harvest time, the price of maize and other grains in the market is very low since the market is flooded, but many farmers are obliged to sell because they lack storage options. Insects, rodents and moisture cause high food losses in traditional grain storage systems. Introduction of hermetically-sealed bags – which cost about US$ 2 per bag – is a straightforward solution. Farmers using the bags are experiencing monthly IRR on their investment of 23% over three years. The bags reduce post-harvest loss from an average of 14% to less than 1%. Additionally, they reduce emissions proportionally, i.e. 0.02 tCO2e per bag per year. Tomatoes are an important source of vitamins in Nigeria. However, the tomatoes travel an average distance of 1,225 kilometers from producing regions in the North to the major consumer market in Lagos. This results in an average of 41% of all production being lost – in transportation alone. A simple technological solution – transporting tomatoes in plastic crates instead of woven baskets – reduces losses during transportation from 41% to 5% and delivers a monthly IRR of 34% over seven months. We estimate that the crates would deliver proportional reductions in emissions, i.e. 0.02 tCO2e per crate per year. Each of these technologies is profitable, but none is used on a widespread commercial basis. Why? Often, businesses find it difficult to access finance to grow because of perceived risk in the market. Also, small businesses sometimes need technical assistance to grow. One example is assistance in improving business planning and accounting practices. In the three cases presented in our report, we find that a cost-effective technology is not the missing link to reducing food loss and waste. The major hurdle to scaling up is the overall business and investment environment. Support to help small businesses increase capacity and absorb investment risk could be catalytic. National and local governments actions to improve the regulatory environment are critical. This includes developing and implementing health and safety standards. While some food loss and waste reduction measures decrease absolute emissions, especially in the dairy sector, they all reduce emission intensity (emissions per ton of food consumed). We recommend expanding the analysis of emission benefits and investment opportunities to include a detailed supply chain life-cycle analysis, which would account for indirect emission benefits related to land-saving. Specific cases should be expanded to address gender and social inclusion. Given increasing global demand for food, producing more food with fewer emissions is a critical means of mitigating emissions. 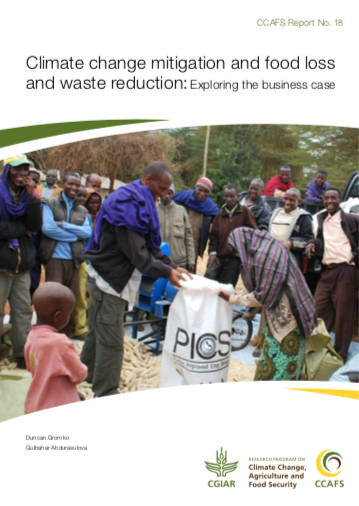 These cases show that action to reduce food loss and waste can help achieve development objectives in poverty, nutrition and climate action AND make business sense. Research in food loss and waste is part of the CCAFS learning platform on Identifying Priorities and Options for Low Emissions Development.